Inquiry based learning encourages students to solve a question or problem through the process of formulating questions, organizing ideas, locating and selecting information, analyzing and synthesizing their findings, sharing this with their peers and reflecting upon what they have learnt. The roles of the teachers and students change depending upon the inquiry approach taken. •Controlled:In a controlled inquiry, the teacher and/or media specialist chooses the topic and identifies materials that students will use to address their questions. Students are often involved with specific exercises and activities to meet particular learning outcomes such as retelling stories, evaluating sources, or comparing approaches. Students often have a specific product such as a Venn diagram, paragraph, or poster. •Guided:In a guided inquiry, student have more flexibility in their resources and activities however they are expected to create a prescribed final product such as a report or presentation. •Modelled: In a modelled inquiry, students act as apprentice to a coach such as a media specialist or classroom teacher. The student has flexibility in terms of topic selection, process, and product. The educators and students work side-by-side engaging in meaningful work. •Free: In a free inquiry, students work independently. They explore meaningful questions, examine multiple perspectives, draw conclusions, and choose their own approach for information dissemination. Recently, there has been a lot of press given to project based learning, and problem based learning, and how these contrast with inquiry learning. All three approaches have merits and a place within different teaching contexts. For an excellent summary of these approaches, and how they compare and contrast, read this great Eduscapes article: Project, Problem, and Inquiry-based Learning. 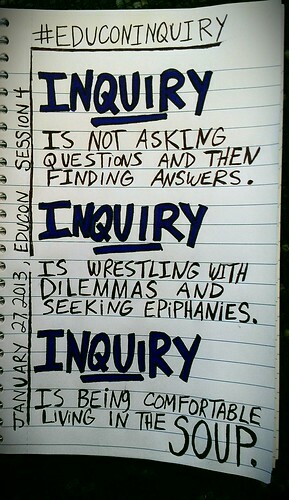 Another terrific article is Defining Inquiry by Lisa Martin-Hansen.